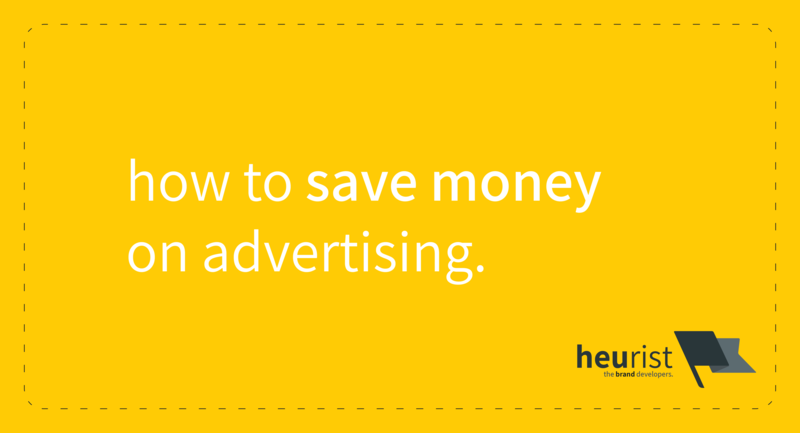 how to stop wasting money on advertising — Heurist - the brand developers. you are here: back home. › our-thoughts › stop wasting money on advertising. stop wasting money on advertising. Do you advertise? Then you might be losing money on it. This article shows you how to optimise your advertising so that you spend less and get more return-on-investment (ROI). So, I ran a Facebook experiment. Don’t get me wrong, I don’t argue against marketing peoples’ businesses. I don’t even argue against advertising. I argue against wasting money on advertising. marketing: ‘[the act of] identifying and meeting human and social needs [profitably]’. advertising: ‘any paid form of non-personal presentation and promotion of ideas, goods, or services by an identified sponsor’. wasting money on advertising: ‘the act of paying for the promotion of ideas, goods, or services without properly identifying the appropriate human needs to meet’. In the next section I will go over exactly how people make the mistake of wasting money on advertising. How advertising is wasting your money. Think about it — when you run an advertisement, you are paying for a spotlight. You are paying for attention. You pay regardless of whether the advertisement you run gets you the result you desire . These digital advertising platforms are insanely attractive. With the average cost-per-click (CPC) on Facebook being around US$1.10 as of 2017 (in the US), it doesn’t cost (that) much to run a digital advertising campaign. And therein lies the problem. How many people like and forget a page? Or worse still, like it but mute notifications from the page entirely? You pay for people to navigate to your page. You aren’t even guaranteed a like, let alone an inclination to purchase what you sell or even engage with you. When you advertise, you’re paying to be seen. But you can’t be sure that what people see is necessarily going to translate into more sales or more engagement (or whatever your metric for success is). In other words, you cannot be sure that you’re going to have any positive return-on-investment from your advertising. The only thing you can be sure of is that you’re losing money if your advertising does not get you your desired results. Unfortunately, losing money on advertising is very easy, while making your advertising effective is very hard — In fact, you cannot guarantee a positive ROI from your advertising, no matter what you do. The best you can do is maximise your likelihood of getting a positive ROI. In the next section, I’ll show you how you can do that. One word. Strategy. With a strategy (and a plan) that suits your business, and your audience, you’ll be spending less and earning more. Use strategy to save you money. Identifying whom to talk to (i.e. your target audience). Identifying what to tell them (i.e. your message). Identifying where to find them (so that you can advertise your message to them). With these 3 steps in place, you’ll know exactly what any advertisement you run should say, and where you should place it so that you maximise your chances of getting your desired results. Working out whom to talk to is basically a challenge of identifying what problem it is you or your product solves and who can benefit from it. By who, I mean, is it a certain demographic of age, gender? A certain socio-cultural group? An economic group? These beneficiaries are then the “whom”. Now, what’s the message? You need a message that carries a customer-focused benefit for people to engage with you . This defines how you present your idea, product, or whatever it is you’re advertising — the “what”you will tell them. The audience must be shown that with your product, they can have a benefit that they can relate to and therefore desire. Now that you have your “whom” and “what”, you can define the “where”. This is arguably the hardest part. You need to then work out where your message will be best heard by your audience, so that you can make the greatest impact with it. For most budget-constrained businesses, the prime location for advertising is typically on digital platforms such as Facebook, Instagram, Twitter, or on Google. To figure out where to focus your advertising efforts, I implore you to visit and create a free account on Statista. Statista provides statistics on a multitude of things, but most pertinent to digital advertising is the demographic and usage data on various social media platforms. For example, here’s the distribution of age and gender of Facebook users in the US. Or even more interestingly, the usage of social media amongst teenagers in the US. With all this information at your fingertips, you now have a general idea about where it is you can advertise to be able to reach the whom that you’re aiming your message at. With these 3 steps in place, your advertising effort now has the strategy it needs to maximise its ability to get you a positive ROI. Check your target audience. Do you have one clearly defined? If not, work one out — you need to know exactly whom you’re talking to for any advertising effort to be successful. Check your message. Is it customer-focused? Can the target audience relate to it? You need to make sure that whatever it is that you’re advertising holds inherent appeal to your target audience. Go ahead and advertise, but pick out the “where”. The great part about digital platforms is that they allow an extremely high level of audience selectivity. Use it. Social media examiner provides an excellent tutorial on how to use Facebook’s audience refinement tool. Likewise, here’s an article on how to target your advertising more effectively on Google. The more you use such tools and get familiar with them, the more control you have over whether the right people hear your message. Basically, if you follow these steps, you will dramatically enhance  your chances of getting the results you want from your advertising, and the less likely you are to be wasting money on it. H. Jack Rotfeld, “Is there a strategy behind buying advertising time and space?,” J. Consum. Mark., vol. 24, no. 3, pp. 131–132, 2007. S. T. Cavusgil and S. Zou, “Marketing Strategy-Performance Relationship: An Investigation of the Empirical Link in Export Market Ventures,” J. Mark., vol. 58, pp. 1–21, 1994. S. Zou and S. T. Cavusgil, “The GMS: A Broad Conceptualisation of Global Marketing Strategy and Its Effect on Firm Performance,” J. Mark., vol. 66, pp. 40–56, 2002.